The Second Doctor, Ben, Polly and Jamie arrive in an abandoned village in the Eastern Front during World War 2 - specifically an island of the coast of Singapore. But, there is something stalking the corridors and surrounding area, something that leaves dead bodies with faces contorted in fear. As the action moves to the jungle surrounding the hotel and the casualty count continues to increase, can the Doctor put that matters right? Elliot Chapman continues to portray Ben Jackson wonderfully. I will admit that I didn't know how I felt about this recasting but I must say that we haven't been disappointed. He does a marvellous job. Frazer Hines also delivers his dopplegannerish performance of Patrick Troughton's Doctor, it does sound quite uncanny. He also recreates his voice of his character Jamie with ease, someone he played nearly fifty years ago, he is always a welcome presence in these audio adventures. Towards the end of the play, Anneke Wills doesn't get a lot of airtime and is more of less relegated to making tea and sandwiches but in the surviving episodes from her run, that is what she tends to do but it doesn't take away from the fact that Polly was an awesome companion! Lisa Bowerman does an excellent job at directing this release and building up the tension from Justin Richards excellent script and all the actors involved do a wonderful job. The music department also do a good job of recreating Japanese styled music as well as some genuinely spooky steel drum music that really makes this adventure work. Atmospheric and horror inclined, The Forsaken is one of the best Early Adventure stories to date. This story plays out like a Hammer House of Horror adventure and is an absolute joy to listen to. 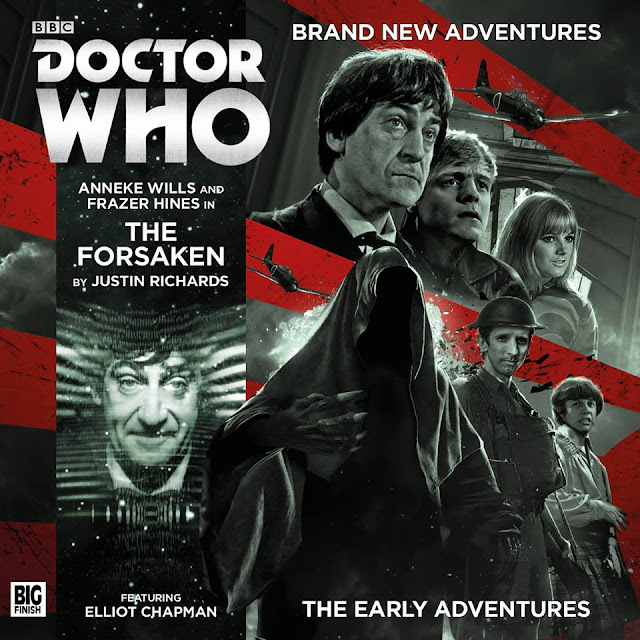 THE FORSAKEN WRITTEN BY JUSTIN RICHARDS AND STARRING ANNEKE WILLS, FRAZER HINES ANND ELLIOT CHAPMAN WAS RELEASED BY BIG FINISH IN OCTOBER 2015.